Take your pick! Make a colorful daisy pillow, or personalize it by adding your own initial. It's so much fun, have a stitching party with your friends. Makes a great gift, too. 1. Measure and cut two 9" felt squares for pillow. 2. Draw your initial or daisy shape on contrasting colors of felt, using the disappearing fabric marking pen. 4. Pin felt shape to center of one pillow square. Use a Running Stitch to attach felt shapes (see Figure A). Stitch about 1/8" from cut edge of felt shape. 5. Pin pillow front and back together. 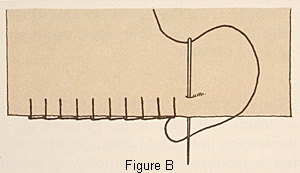 Stitch outside edges together using a Blanket Stitch (see Figure B). Leave 5" unstitched at bottom for stuffing. 6. Stuff pillow. Pin opening closed and complete stitching. TIP: Disappearing ink marks will usually disappear within 24 to 72 hours, or you can remove them with a damp cloth. Project designed by Janis Bullis.